HRV 3C Protease is fused to GST, so that the protease is easily removed from cleavage reactions using immobilized glutathione (GSH). HRV 3C Protease is highly active at 4oC, and also active in a variety of commonly used buffers, providing more flexibility in experimental design to keep the activity and intact structure of the target proteins. HRV 3C Protease is a recombinant cysteine protease used to remove fusion tag from proteins with the HRV 3C cleavage sequence. HRV 3C Protease is highly specific for the PreScission Site, Leu-Glu-Val-Leu-Phe-Gln-↓-Gly-Pro, and cleaves between the Gln and Gly residues. A 66 kD GST-fusion protein (1) at 1 mg/ml is reacted with HRV 3C Protease at a ratio of 1: 100 (w/w) in cleavage buffer at 4°C for 4 hours (2) and 3 days (3). The cleaved products are 40 kD and 26 kD. 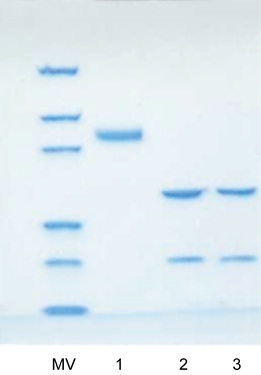 1 unit will cleave >95% of 100 µg His Tag fusion control protein in 50 mM Tris-HCl, 150 mM NaCl, pH 7.5 at 4°C for 16 h.